Happy Tuesday to all our followers and supporters! Last week, on September 17th, Project Tomorrow’s CEO Julie Evans participated in a panel discussion at Brookings in Washington D.C., concerning the subject of mobile technology in our K-12 schools. 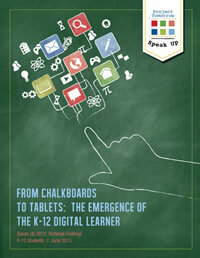 Mobile technology is in a plethora of ways transforming education in the United States. But what do these changes look like, and what do they mean for the enhancement of educational comprehension for our K-12 students? To learn more, view the panel discussion here. Be sure to let us know your thoughts, and join the conversation on Twitter at #ProjectTomorrow, #SpeakUp, and #TechCTI. 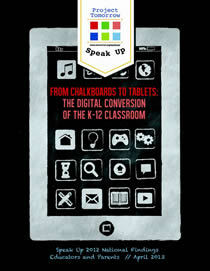 Don’t forget to register your school/district for Speak Up 2013! The countdown to October 2nd is on! This entry was posted in Speak Up and tagged brookings, Julie Evans, K-12 education, mobile technology, Speak Up, Speak Up 200, Speak Up 2013 on September 24, 2013 by project_tomorrow.